This is basically condensed milk and dessicated coconut cooked together, cooled and then rolled. You could use crushed cardamom, saffron or nuts for flavor. I have used some pistachio essence and chopped pistachios. Yield : About 12 small laddoos. Procedure: Take the condensed milk and the dessicated coconut in a heavy bottomed pan. Cook on low heat for a about 3-5 minutes or till the mixture comes together, away from the sides of the pan. Mix in the pistachios and the essence. Cool slightly. 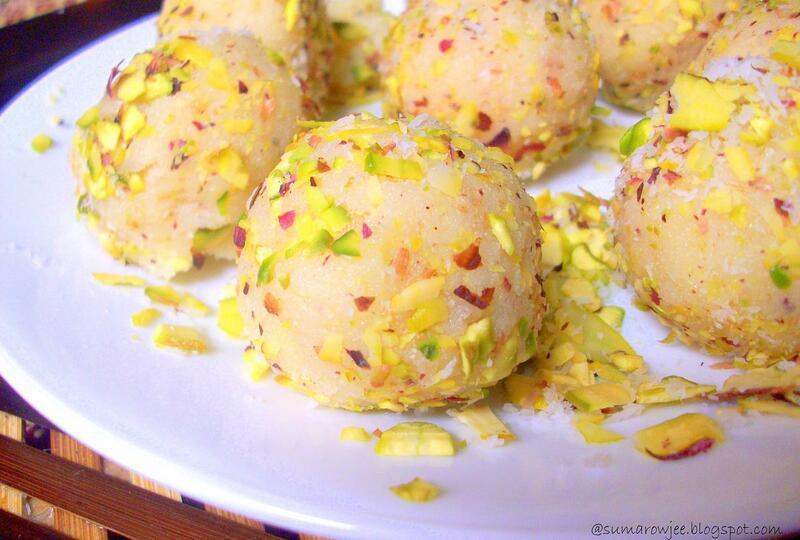 Roll into laddoos. 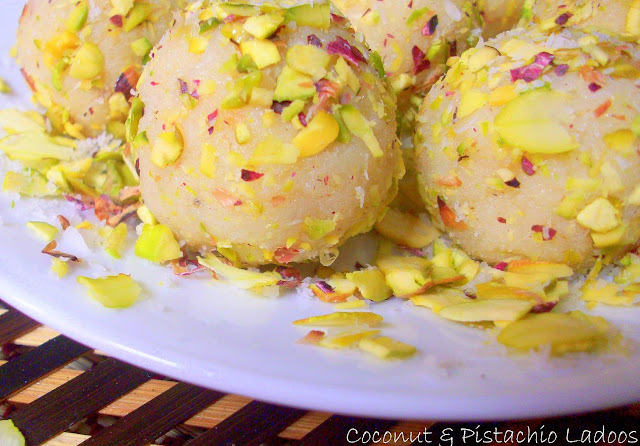 Roll them in chopped pistachios and there you are! Seriously quick and simple right? P.S: Forgive me again for the sloppy pics, will you? My excuse this time is less light on a cloudy day and even less patience! I am a real spoil-sport when it comes to my determination to not eat high-calorie and fat-laden food when I don't want to eat it. Well I would eat it 24/7 if I could afford to, but when I am trying to lose weight, which is every now and then, people around me have a hair- tearing time. My mother for instance when I visit her during holidays and she can't get me to 'eat-well'. Hubby and kids when they want to eat out and I insist on eating only at that Punjabi dhaba as the food is less oily and I still get to eat a good meal. I carry my apple or orange or salad in my voluminous bag as I don't to be tempted to grab that burger when the kids eat out. Exasperated hubby tries to sell the idea of eating a 'healthy' option on the menu and gets an earful about its nutrition quotient or lack of it. I shudder in mock-shock and he throws up his hands in real despair. I will bake, but not eat. I won't miss my early morning walks in icy December or during summer holidays when I can easily sleep in - I can be really obsessive here too! Am forced to as even as my dietitian gets ready to write me a note of commendation for my will power, I will be hiding under the table and writing her a sheepish note of my tragic story of the kilos regained...Sigh! I try to lose weight every year and I manage to do so, but also manage to spite the scales quite quickly. A sad story familiar to my family and friends. I have a tendency to gain weight and a metabolism which is not exactly my pride and stands absolutely no chance of being anybody's envy. From Deeba's PAB which she has adapted from Meeta's What's For Lunch Honey . 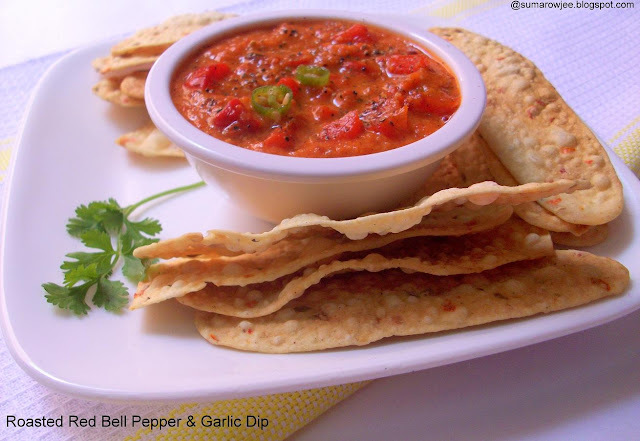 Meeta's dip has red bell peppers, aubergines and garlic, roasted and mashed with other spices. Deeba's version which I have tried has tomatoes and no aubergines. You could roast the veggies in the oven or over an open flame or on a griddle and puree them or leave them chunky. The dip is quite easy to make, roasting and peeling the veggies the only time-consuming part. You could of course play with the spices and the veggies to suit your taste and preference. But I would surely suggest a generous addition of spices, fresh ground pepper and lemon juice and of course a good 2 table spoons of olive oil to get a flavorful dip. 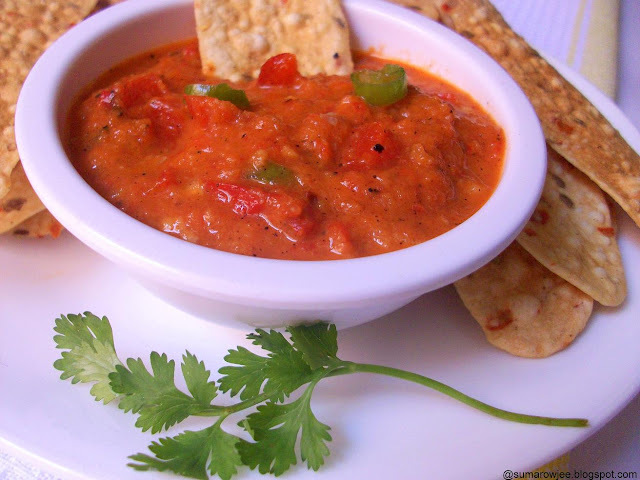 The below recipe makes enough to serve 4-6 people, remember its spicy! Here is what I did. Red bell peppers - 2, medium sized. Procedure: De-seed and roast the peppers and tomatoes on a greased griddle or on an open flame or grill in the oven. Roast till the skin is completely charred and blistered. Roast the garlic till lightly browned. Keep the peppers and tomato in a dish with a lid or in a zip-lock bag and seal. The steam will help loosen the skin for peeling. Cool and peel the skin. You could mash the peppers and tomato with a fork or puree in a blender. Chop the veggies and garlic roughly. Keep aside 2-3 tablespoons of this. Run the rest of the veggies and garlic in the mixer for a few seconds, just enough to very roughly puree. Add the rest of the ingredients, the reserved chopped veggies and mix. Check and adjust seasoning. You could store this in the refrigerator for up to a week. But I think, this tasted best the day I made it. Come to think of it, we do make chutney like this, we do eat creamy dips with crackers, but eating a chunky veggie dip with papad or lavash crackers is a great idea. Thanks Deeba and Meeta! 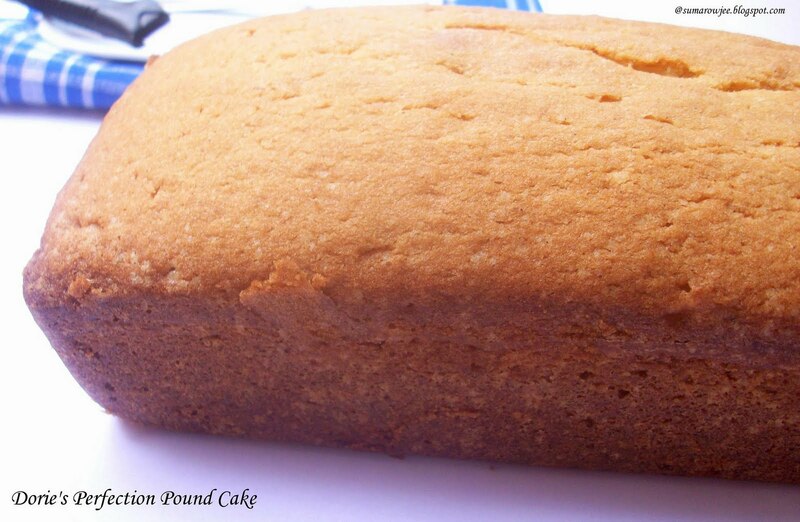 A pound cake is traditionally a cake with one pound each of butter, sugar, eggs and flour. The pound cakes baked now are not exactly with these proportions but nevertheless are rich, buttery and of course delicious! Different countries and different regions have their own variations of this cake. Difference in flavorings such as vanilla or almond extract, dry fruit and nuts, addition of milk or buttermilk or sour cream to make the cake more moist make for some variations. - Source Wikipedia. Then again we have pound cakes with melted chocolate or cocoa added to them to make a chocolate pound cake. How about a vanilla-chocolate tango, a marbled pound cake? Or one with lemon and poppy seeds? Or orange zest? Chocolate chips? Hmmm... as if this delicious confusion is not enough to muddle my brain, I had to contend with all the various recipes and variations I could try! An indecisive person, I spend more time in deciding on a recipe than in actually baking one! Honestly speaking, I can't really do a comparison of family heirloom recipes or launch into nostalgic accounts of pound cakes I have grown up eating. My mother has never baked and she actually thinks I am really crazy to be spending so much time on baking. Mother-in- law used to bake ages ago and rarely, she is thankfully now coming to terms with my baking obsession. 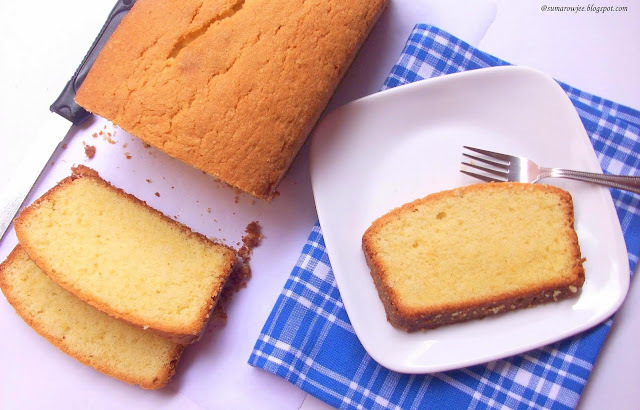 I have not eaten a great deal of cakes when I was a kid, none which left an impression on my foodie brain at least, except for a butter sponge which we would get from Bangalore sometimes. 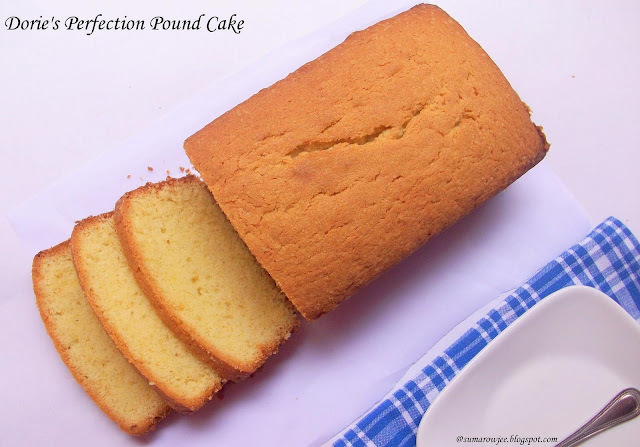 So the introduction of a pound cake has come quite late to me, very recently in fact and hence it follows that the quest for a perfect pound cake which suits my taste is still far away. Procedure: Pre heat oven to 180 degrees C / 350 degrees F. Grease, line and flour a 9''x 5'' loaf tin. Sift together the flour (salt if using) and the baking powder. Keep aside. Place the butter and sugar in a large bowl. Using a hand mixer, cream on high speed for 5 minutes, till light and fluffy. Add the eggs, beating for 2 minutes on medium speed between each addition. Add the vanilla. Fold in the flour using a silicon spatula. Transfer the batter to the prepared tin. bake for 40-60 minutes or till a tooth pick inserted in the center come out clean. I baked for 65 minutes. Remove from the oven, cool the cake in the tin on a rack. Allow the cake to cool in the tin for 15 minutes. 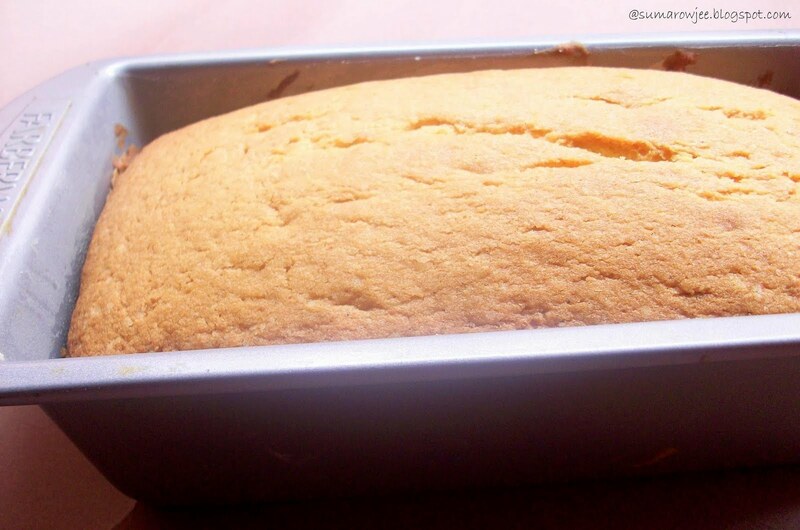 Run a blunt knife around the sides of the cake and transfer it to the cooling rack. Cool completely before slicing. How I liked it - A very delicious cake indeed! Very buttery and rich. I personally do not relish bakes very rich and buttery, can't eat more than just one slice you see;-) , but if you do, you will love this! 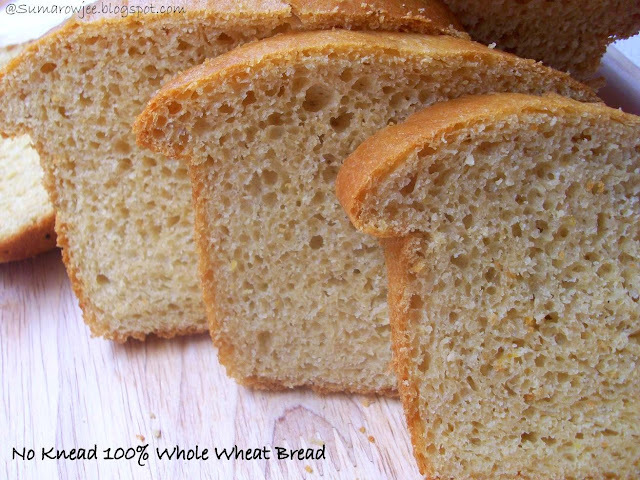 No - Knead 100% Whole Wheat Bread - Easy And Quick! The dough here is quite loose as in all no-knead yeast breads and is mixed in a mixer for 3 minutes. After reading the reviews on the KAF site, I was all set to mix the dough with the dough hooks of my hand mixer. But to my horror, the dough started to crawl up the hooks and gave me an electric shock! Thankfully, I had my wooden spoon ready and I beat the very sticky and very viscous dough 200 strokes by hand. And yes, of course, I had an achy arm and shoulder the next 2 days. The recipe said the dough would take 60 - 90 minutes to rise to the rim, but mine surprised me by rising way over the rim in about 35 minutes in this no-sun weather. I should have seen it coming, considering the amount of liquid and yeast in the dough. Well, I got a nice loaf, but was left wondering if I could have done it better and easier. Would using a little less yeast give a slower rise to just to the rim and give me better bread? Next day. No mood to strain my arms more. I thought of using the hand mixer for beating part of the flour with all the liquid and then mix in the rest of the flour as I had made in the No Knead White Batter Bread. Less yeast. The dough took longer to rise, the bread was good, the hand mixer did the work. Good, but the dough in the loaf tin on the site doesn't look very tall, why not make this bread in my 9x5 pan? Day 4 - I gave a day's break as my house help was beginning to get convinced that I was really crazy, am sure by now she is!! The bread was OK, shorter and flatter, but I liked it better in the 8 1/2'' by 4 1/2'' pan. Long story short, I baked the bread again in the smaller tin with the amount of yeast specified in the recipe, mixed with hand mixer, watched the dough like a hawk while it rose just till the rim. Baked the bread, got a decent loaf. Matodi Palya also called as Matawadi Palya is a dish made of soaked Bengal gram or Chana Dal and fenugreek / methi leaves. 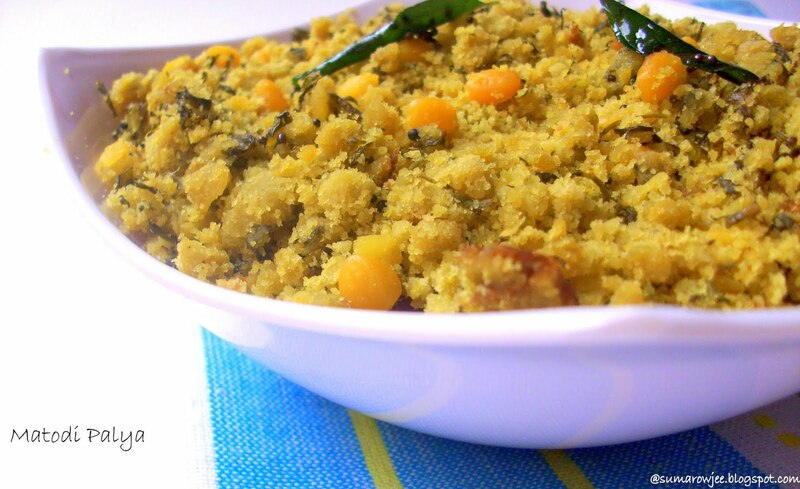 It is one of those dishes which fall under the category of extremely tasty but time and oil consuming ones! You need to plan ahead as it needs the dal to be soaked for a few hours, the methi leaves picked, washed and chopped. Hence this is made as part of a special meal on a festival day or a weekend when you can over eat and play couch potato. This vegetable or palya as it is called in Kannada is quite crumbly by itself, making it necessary to add more oil (gulp!) when it is mixed with rice. It is eaten as a special combination with curd based gravies such as Majjige Huli or Hasi Majjige and even gojju or sweet and sour gravy. This is my mother-in-law's recipe and boy was I glad she made a lot of it!! I won't tell you that I hogged on this and how!! Procedure: Wash and soak the Bengal gram in enough water for about 3 hours or till soft. Think Masala Vadas! 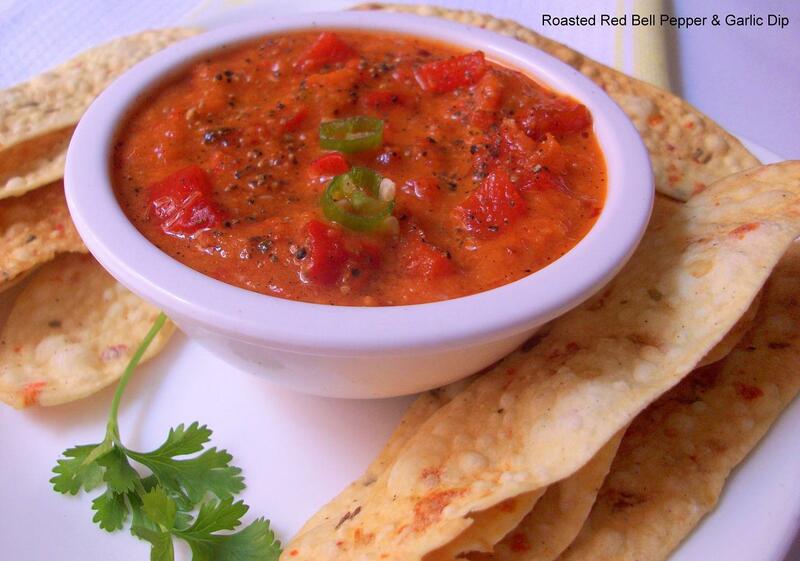 Grind the dal to an almost smooth paste using as little water as possible. A few whole grains here and there is fine. 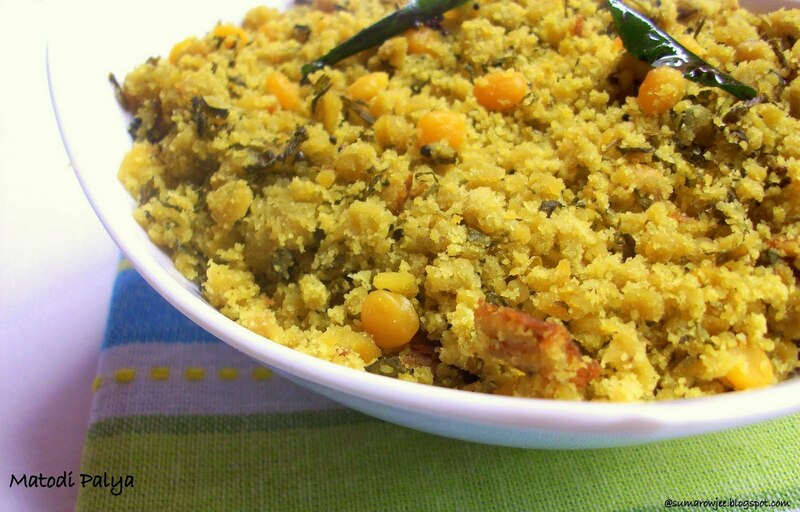 Grind the coconut, jeera powder, hing and green chillies to a smooth paste. 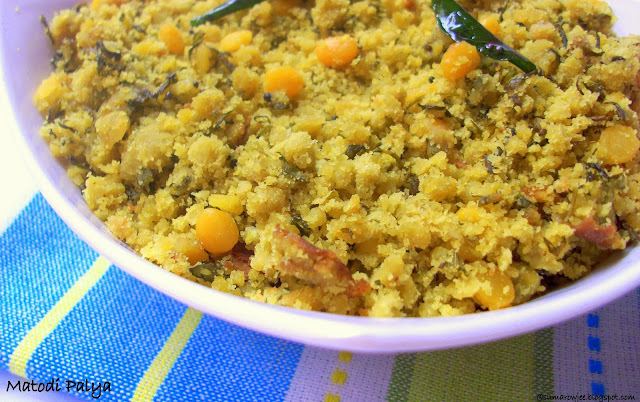 In a large bowl, mix the ground dal, coconut paste, turmeric powder, chopped methi leaves and salt to taste. The ground mixture may taste spicy now, but once fried it will be less spicy. At this stage you could steam the mixture till cooked and then carry on with the rest of the procedure. Lower the heat, cover the pan with a lid. You need to keep mixing the palya every 5 minutes or so for about half an hour. The raw smell should disappear, the dal cooked, crumbly and oily when done. Serve with hot rice and oil, gojju / majjige huli / hasi majjige...The above quantity serves 3-4 people. The cute little girl got herself into the school auto when she was barely 3, got everyone at home panicky, searching for her all over the town. Innocently held out Rs.100(meant to be her school fee) at the school canteen when all she wanted was a packet of biscuits, now flashes her own cards. Did her first few Bharatnatyam poses as a kid on the porch of her granny's house and now recently did her arangetram. Walked with me and hubby up the steps, holding hubby's hand as we stepped on the dias for our wedding reception. Now insists that I sit with hubby in the front seat in the car always. From Barbie's kitchen to baking her first focaccia recently! Cute little shy girl to the pretty and confident teenager with her own driving license! From Tom & Jerry talk to talk about her first prom and outrageously high heels, the 5-year-old I saw when we got married is now a big girl! Big enough to travel half way across the globe to India all on her own. Well, well, time certainly flies! When hubby's niece was visiting us last month, she seemed to have only three preferences when it came to desserts and bakes. Congratulations! You guessed it right! Chocolate, chocolate and some more chocolate! Second on her preference list was coffee. So it was Coffee Walnut Cookies, Two Minute Microwave Brownies, Queen Of Sheba Cake, a one bowl chocolate cake, Cappuccino Muffins and Chocolate Wafers and Coffee Cream sandwiches. The wafers here are cookies sliced from chilled cookie dough and baked till crisp - ice box cookies. Aren't they so convenient? Extremely easy to put together, good enough to eat as is. 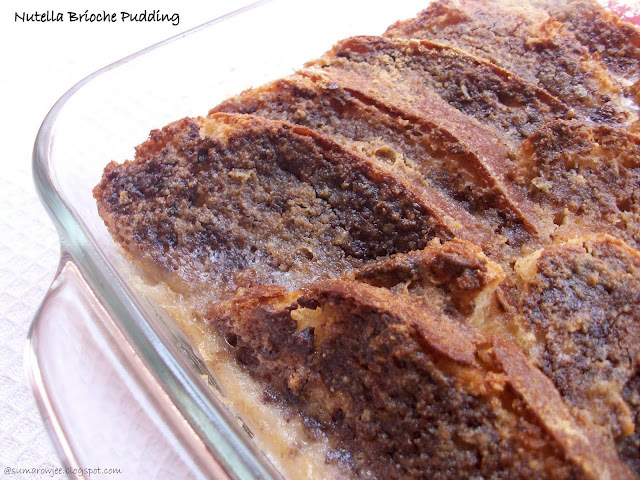 This again is another recipe I had bookmarked from Smitten Kitchen. Debbie has made Icebox cupcakes with the wafers. 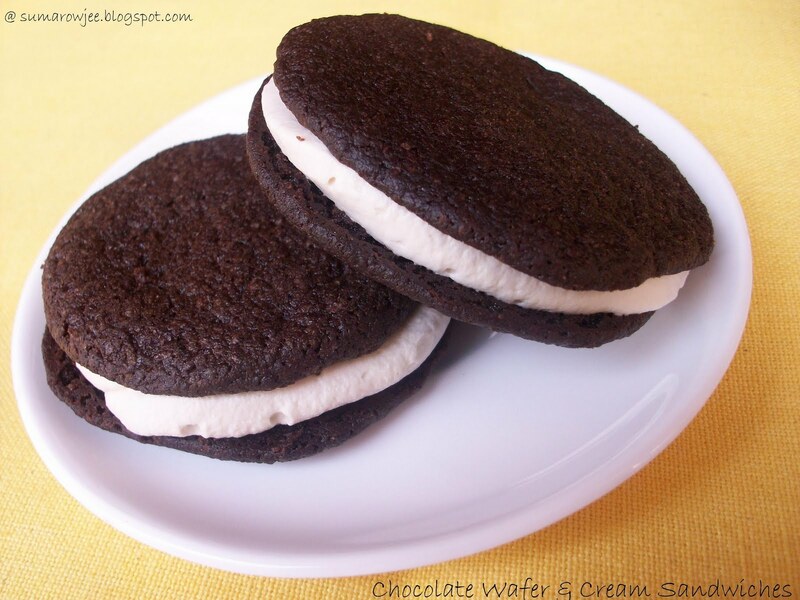 Cookies and whipped cream sandwiched in layers and chilled so that they are softened when you eat, like cupcakes. If you want to eat them as soon as the cookies are off the cooling rack, no real harm sandwiching them with some coffee cream and eating them right away. Crisp chocolate wafers, soft and cool coffee cream...You could of course add any choice of flavoring to the cream, vanilla, coffee, some roasted nuts, chocolate chips, what's your fancy today? Adapted AGAIN from Deb's Smitten Kitchen, original recipe from Alice Medrich's Pure Dessert. I halved the below recipe to give me about 30 cookies. 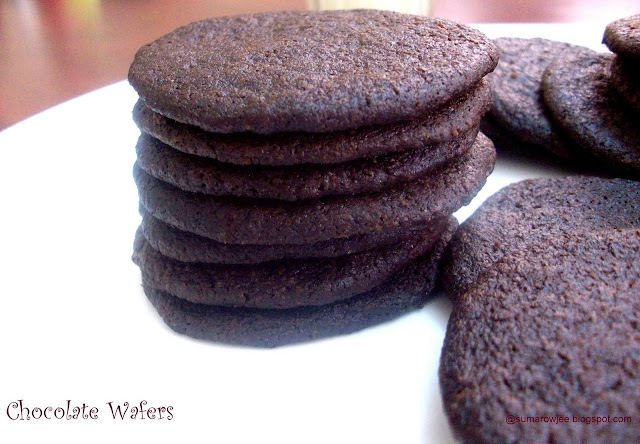 The number of cookies you get depends on how thin you slice the dough, which again varies the baking time. So a test batch really really helps when you bake cookies of any kind.. I would suggest weighing of ingredients for accurate results. More butter or less flour will lead to cookies spreading too much. Procedure: Combine the milk and vanilla in a small cup. Keep aside. Combine the flour, cocoa, sugar, salt, and baking soda in a large bowl. Cut in the butter into the dough using your hand mixer. Once the dough becomes sandy, add the milk mixture. Knead lightly to form a dough. If using a food processor for this, combine the flour, cocoa, sugar, salt, and baking soda in the bowl of food processor and pulse several times to mix thoroughly. Cut the butter into about 12 chunks and add them to the bowl. (You could use butter that's chilled ,need not be slightly soft) Pulse several times. With the processor running, add the milk mixture and continue to process until the mixture clumps around the blade or the sides of the bowl. Transfer the dough to a large bowl or a cutting board and knead a few times to make sure it is evenly blended. Form the dough into a log about 14 inches long and 1 3/4 inches in diameter. Wrap the log in wax paper or foil and refrigerate until firm, at least one hour, or until needed. If you have used slightly softened butter, your dough needs to chill a little longer as it needs more time to firm up. Preheat the oven to 180 degrees C / 350°F. Line the baking sheets with parchment paper. Cut the log of dough into slices a scant 1/4-inch thick or about nearly 1/8 of inch as Deb has done. Place them one inch apart on the lined sheets (cookies will spread). If using a huge oven position the racks in the upper and lower thirds of the oven and preheat the oven. Bake, rotating the baking sheet from top to bottom and back to front about halfway through baking, for a total of 12 to 15 minutes. You can detect more than a trace of envy here? The cookies will puff up and deflate; they are done about 1 1/2 minutes after they deflate. Cool the cookies on the baking sheets on racks, or slide the parchment onto racks to cool completely. Deb's Note: These cookies should crisp as they cool. If they don’t, you’re not baking them long enough, says Medrich - in which case, return them to the oven to reheat and bake a little longer, then cool again. 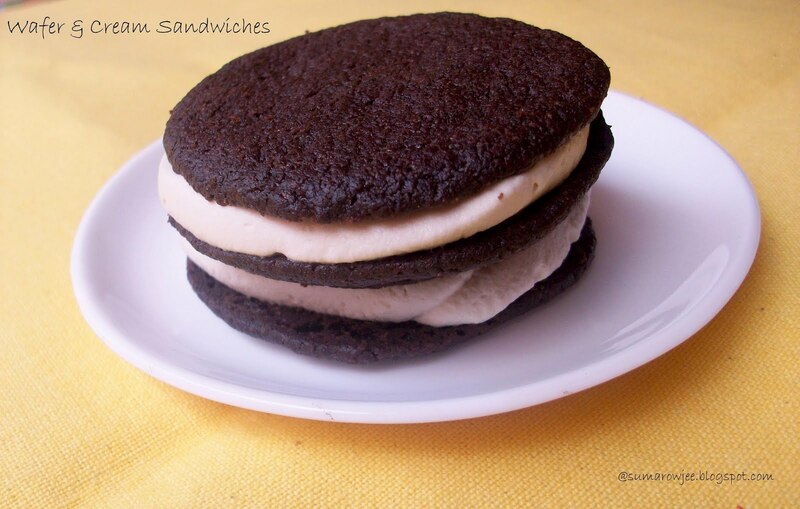 Enjoy them as fresh cookies or as sandwiches with ice cream or flavored whipped cream or as Ice-box cupcakes. Disasters! How I dislike this D word, particularly in my kitchen! My first ever baking disaster was when I baked a chocolate cake for hubby's birthday. I had got my shining new OTG. My son was then in his terrible two's and I stayed up late in the night so that I could bake after he slept. The delicious chocolate cake batter chose to overflow, causing a bit of mess and a lot of heart-ache. Wrong size pan obviously. Hubby gamely ate the remnants of his good-but-almost-not-there birthday cake in the tin. Then it was my son's birthday and Bird Flu had created quite a scare. New baker me wanted to bake an egg less cake. Back then, we did not have a computer at home. Internet was alien to me (yes, people like me DO exist!) and I did not know anybody who baked. So you can imagine. I baked an egg-less cake which turned out to be a REAL disaster. And I had the gall to bake it the same day as the party! The cake was as dense as a brick, no make it 2 -3 bricks laid side-by-side. We lit the candles, blew them and then the cake went straight to where it belonged - the trash can. My friends still tease me about that cake. Thankfully, sister-in-law had got a Coffee Walnut cake from Sweet Chariot as one of her surprises for the relieved birthday boy. My latest disaster was when I tried my hand at baking a brioche. The brioche did not rise as tall as it was supposed to and it developed a gaping horizontal crevice as it baked. Ignorant me did not think much about it. The crust was a beautiful brown and my thermometer read the right temperature. I was so happy, was almost ready gathering my props for the pictures. But I first had to tell about this to my teacher. But she pulled the ground beneath my feet when she said that sweet rich breads NEVER split. I had gone wrong somewhere. However there was nothing else very drastically wrong with it, taste-wise fine, a bit dry though. A few slices disappeared as French Toast and a few got stashed into the freezer. One disaster a base for a better dessert? A Nutella pudding had to be made before the contents of the jar disappeared magically on its own. I know, this is not by far the most beautiful looking pudding ever. But it certainly was good! 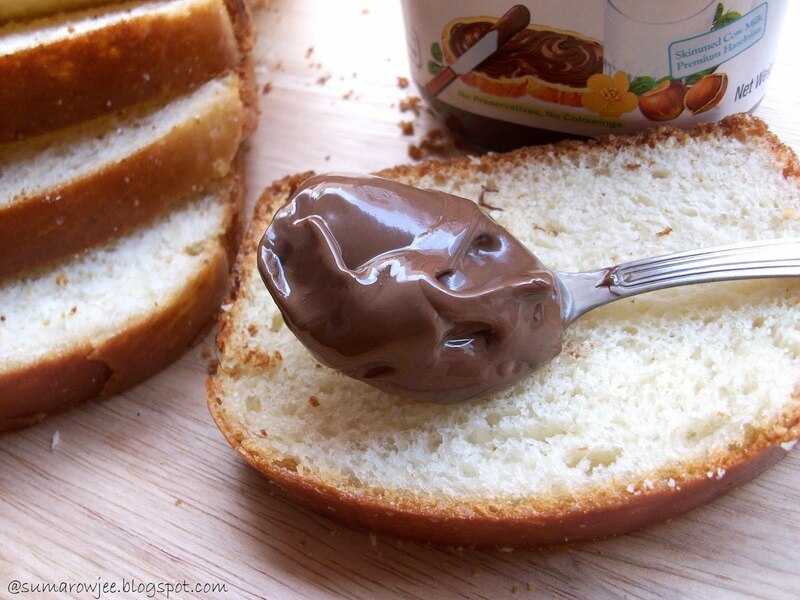 Nutella spread on slices of brioche, soaked in a rich custard sauce and baked. Is there anything to not like about it? Recipe adapted from Susan's Wild Yeast, original recipe from Epicurious. I have made a couple of small changes as the cream I used was sweetened and I was adding Nutella too. I personally find Nutella a little too sweet, so I have not used a whole lot of it. You could use more to your taste, add sugar as and if needed. The original recipe has Amaretto added to it. You could bake this in a pudding dish or individual ramekins, in which case the baking time would vary. You would also need to cube the bread slices. Procedure: Butter an 8'' square pudding dish. Reserve half a slice. 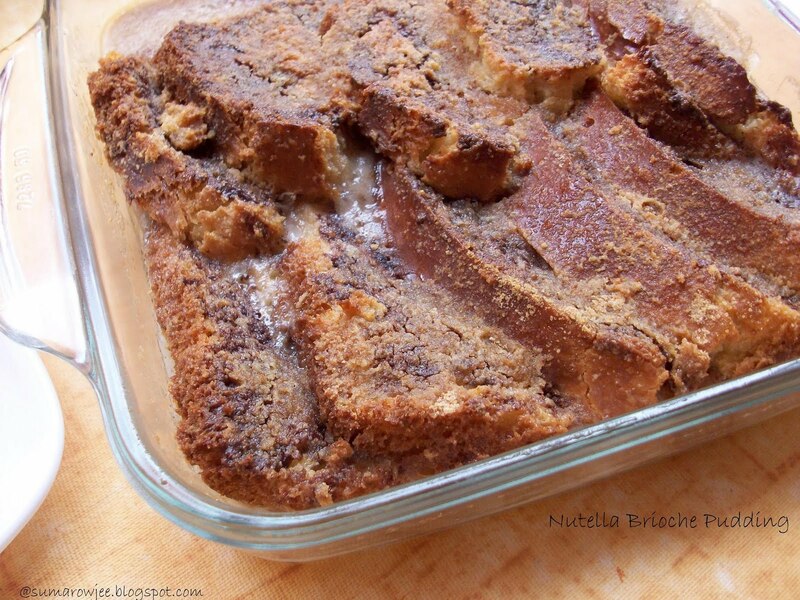 (You could also trim the crusts and reserve them instead) Spread the Nutella on the rest of the slices of brioche. Cut the slices diagonally. Arrange them in the dish so that the peaks show neatly. Whisk the eggs in a bowl. Add the cream, milk, sugar and the extracts. Whisk well to combine. Pour this over the slices of brioche. Use a spoon to push the bread slices to soak the custard. Let stand for about 40 minutes. (At this point, you could cover and refrigerate for up to 2 hours). Occasionally press down the slices into the custard or spoon the custard over the slices. While the bread is soaking, bake the crusts or the reserved bread cubes in an oven pre-heated to 180 degrees C / 350 degree F, for about 10 minutes or till dry. Maintain oven temperature. Once done, process them in your food processor to get fine crumbs. Reserve. Sprinkle the crumbs over the pudding. I over did this part, hence my pudding lost that Nutella top! Prepare a water-bath. I have used my 12'' round tin for this. Use any dish which can easily fit your pudding dish. Place a clean kitchen towel (a small thin one preferably, a thick one may raise the height too much) in the bigger tin. Place the pudding dish on it. Carefully pour enough hot water in the larger dish such that the water is halfway up the sides of the pudding dish. The water bath offers protection against the custard curdling as it bakes. Bake for 50-60 minutes or till a tooth-pick inserted into the center comes out clean. Check at 45 minutes. If you press down on the top of the pudding, the custard should not come up. This means that the pudding is done. If any custard comes up, you need bake a little longer. The above baking tips are from Stephanie's Joy Of Baking. Remove the pudding from the water bath. Serve the pudding warn with a dusting of vanilla sugar if you wish. The pudding was good warm and not too sweet, the top crispy and soft creamy custard underneath. Makes a simple but delicious dessert on a cool day. What better a way to use up left-over stale bread or not-perfect brioche!